The largest cargo ship to visit the United States, the CMA CGM Benjamin Franklin, arrived in Seattle on Monday morning, underscoring the fierce competition the Puget Sound ports are facing as they seek to attract ever-larger ships. The largest cargo ship to visit the United States, the CMA CGM Benjamin Franklin, arrived in Seattle Monday morning to greetings from Seattle Mayor Ed Murray and other dignitaries and a flurry of media coverage. Longer than the Empire State Building, wider than the width of a football field and as tall as a 20-floor building, the gigantic ship loomed at The Northwest Seaport Alliance’s Terminal 18 as Murray proclaimed Seattle’s past, present and future as a center of the maritime industry. But beneath the pomp and publicity, the big ship’s arrival underscores the fierce competition the Puget Sound ports are facing as they seek to attract these ever-larger ships. Global container traffic is flat, shipping companies are seeking to make fewer ports of call, and competition is strengthening everywhere — from ports in Canada to those on the East Coast awaiting the widening of the Panama Canal. Capacity: 18,000 TEUs (twenty foot equivalent units, the standard unit of measurement for cargo capacity). The visit by the Benjamin Franklin is intended to show that The Northwest Seaport Alliance — the marine cargo operating partnership of the ports of Seattle and Tacoma — can handle such big ships, which are seen as the future of the industry. 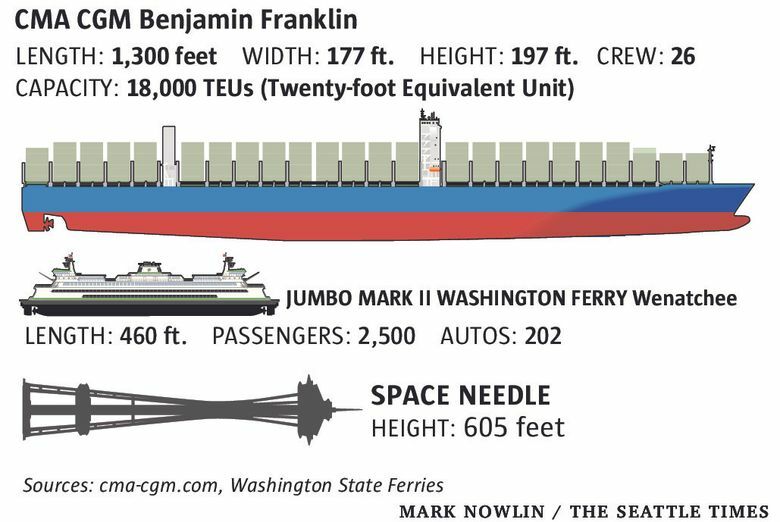 At 1,300 feet long, 177 feet wide and 197 feet tall, the Benjamin Franklin has a capacity of 18,000 TEUs (or twenty foot equivalent units — the standard unit of measurement for cargo capacity). Typical-size container vessels now run in the range of 8,000 to10,000 TEUs — itself a rapid change from 10 years ago, when 6,000 TEUs was the average, said Peter McGraw, a spokesman for The Northwest Seaport Alliance. The Benjamin Franklin, owned by French container shipping company CMA CGM, is stopping in Seattle, after previous stops in Long Beach and Oakland. It’s part of a test call to see how quickly cranes at the ports can load and unload, how quickly containers can be moved to and from the port, and how quickly the items can be delivered to their final destinations. On this visit, the ship will be unloading cargo from China including electronics, clothing, furniture and sporting goods intended for the likes of Target, Best Buy and Amazon. Because the Benjamin Franklin greatly exceeds the size of ships the ports usually see, the test call will show what parts of the infrastructure need to be expanded or upgraded. Terminal 18 already has the cranes to handle this size vessel, and the alliance is upgrading Terminal 5 to make it big-ship ready as well, McGraw said. It will take about $400 million to $600 million to update the terminals, estimated John Wolfe, CEO of Northwest Seaport Alliance. But it’s not just the terminals themselves that would need upgrading. Over the next 10 years, a total of about $800 million to $1 billion will be needed to upgrade the terminals in the Seaport Alliance and the connecting freight infrastructure, including the network of roads and rails, Wolfe said. He said a mix of federal, state and local grants, and private-sector support, as well as the ports’ own revenue streams, could fund the upgrades. The upgrades are seen as important for the port to remain competitive at a time when many West Coast ports are seeing flat or lower container traffic. Currently there are “too many ships and too much cargo space on those ships and not enough demand,” said Jean-Paul Rodrigue, a professor of global studies and geography at Hofstra University who specializes in maritime shipping. Container traffic at the ports of Seattle and Tacoma, for instance, decreased slightly from 3.6 million TEUs in 2004 to 3.4 million TEUs in 2014, according to a database maintained by Rodrigue. In order to save money, shipping companies are turning to ever-larger vessels since the fuel and crew costs of running a larger ship aren’t much bigger than those for a smaller one. The problem for ports is that with the amount of cargo holding fairly steady, there will be fewer such ships. And when the ships come, there would likely be a flood of work and congestion with thousands of containers moving into and out of the ports. But after they leave, there would be less work. And because ships want to minimize their times at ports, since they make their money transporting cargo across the water, it’s likely they’ll be seeking fewer ports of call, Levinson said. With the Panama Canal widening to accommodate bigger ships, carriers may find that ports on the Atlantic Coast might prove faster in getting their cargo to Chicago, where most of the cargo currently coming into the Northwest Seaport Alliance goes. But the Port of Seattle is more worried about competition from Canada than from what might happen with the Panama Canal. About 53 percent of the cargo coming in through the Northwest Seaport Alliance is from China. “If you’re the head of a port, you’re pressured to accommodate those bigger ships or lose that business entirely,” said Rodrigue, the Hofstra University professor. Port Commissioner Stephanie Bowman on Monday framed the importance of getting a big ship like the Benjamin Franklin to make Seattle a regular port of call in terms of jobs. “Every container on this vessel represents jobs and opportunities for our region,” she said, adding the average wage in the Puget Sound maritime industry is $71,000 and that there are 50,000 jobs directly related to the ports of Seattle and Tacoma. Ed McCarthy, a senior vice president with CMA CGM, didn’t give a timeline Monday for how long the company would take to evaluate whether to make Seattle part of the regular route for the Benjamin Franklin and other such large ships. The Benjamin Franklin typically travels Europe-Asia routes. It is expected to load up on agricultural goods from Eastern Washington, including hay, lentil, apples and lumber, as well as machine parts, before it departs Seattle for China at 8 a.m. Tuesday.